Astronautsaboard the International Space Station say they would welcome the arrival ofthe outpost?s new orbital room, even if it is named after comedian StephenColbert. NASAastronaut Michael Barratt currently living aboard the space station said he isconfident the rightname will be chosen for the outpost?s new Node 3, which is slated to bedelivered early next year. ?I?m surethat the right people will make the right decision,? Barratt told reporters viaa video link last week. ?We?ll be happy to live in the node whatever it?scalled.? Colbert, acomedian and host of Comedy Central?s faux-conservative show ?The Colbert Report,?urged his fans to write in his name during NASA?s recent online poll to nameNode 3. When voting ended in late March, Colbert?s name had amassedmore than 230,000 votes, far outdistancing NASA?s top suggestion ?Serenity?by 40,000 votes. NASA?s pollrules clearly state the agency has the final word on Node 3?s name. ?NASA will take into considerationthe results of the voting. However, the results are not binding on NASA andNASA reserves the right to ultimately select a name in accordance with the bestinterests of the agency, its needs, and other considerations,? the rules state. ?Such name may not necessarily be one which is on the list of voted-oncandidate names. NASA?s decision shall be deemed final.? Still, Colbert has continued to campaign for his name. He called on NASAto maintain ?democracy in orbit? during a recent episode of his show andrenewed his bid on Monday night. ?NASA, don?t make me strap a rocket to an intern and launch him intospace with a can of spray paint,? Colbert said during Monday's episode of his show. Some sources have suggested NASA might meet Colbert?s fans halfway andname Node3?s toilet after the comedian. NASA is expected to reveal the final namesoon, agency officials have said. Barrattsaid he missed much of the excitement surrounding Node 3?s naming poll becausehe spent the last few months in Russia training for his March 26 launch to thestation. It was only after he arrived at the outpost, that the station?s crewfilled him in. ?This fighthas just begun,? Colbert said, adding that he has received some support frommembers of Congress. ?Congress, stay on this! If you don?t, I will fight it everystep of the way, from the Supreme Court to the Space Court.? Barratt isnot the only one eager to see Node 3 delivered regardless of its name. NASAastronaut Kay Hire is on the space shuttle crew that will deliver Node 3 inFebruary 2010. ?What thefinal name is going to be, I have no idea, but I am more than happy to helpdeliver that node no matter what it?s named,? Hire told SPACE.com lastmonth. 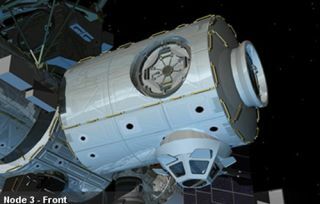 Hire andher crewmates will deliver Node 3 and its attached observation portal, known asthe Cupola, when their shuttle arrives at the space station in February 2010.Node 3 is a cylindrical room that will be attached to the bottom of the spacestation, where it will be filledwith a bathroom and eight refrigerator-sized racks of equipment thatincludes much of the station's life support gear. Hire saidNASA?s voting poll may have received an unexpected response thanks to Colbert?sfans, but the result is very positive. ?I thinkit?s actually really interesting,? she said. ?We think it?s kind of cool inthat, if nothing else, it?s just bringing in a new group of people that maybedidn?t pay attention to NASA or the International Space Station or the spaceshuttle before.? She addedthat she planned to cast her own vote before the polls closed, but was excitedto see Node 3, and by extension NASA, shine in the public spotlight. ?Anythingthat allows the public to take a look at what we?re doing here at NASA, I thinkthat?s a good thing,? Hire said. SPACE.com Staff Writer Clara Moskowitzcontributed to this report.